Christened as Fireblade, Honda CBR1000RR is loaded with mammoth engine, excellent aerodynamic features & mind blowing brake quality. Get info on features, technical specifications, mileage & price. After seeing enough of show by Yamaha YZF-R1 and Suzuki Hayabusa, Honda Motorcycle and Scooter India Private Limited (HMSI) launches its super power bike Honda CBR1000RR christened as Fireblade to pit against its adversaries. The Honda CBR1000RR is the latest edition designed by a team of engineers from Honda and poses tough competition in the superbike segment. Honda CBR1000RR Fireblade is a MotoGP race replica taking cues from Honda's top-end racing bikes. It borrows many technologies found in the Honda CBR600RR but has been added with the reworked chassis and exhaust system, improved front and rear suspension and a lighter swingarm. Honda CBR1000RR is a top notch performance bike with the mammoth engine. The Fireblade is powered with a 999cc liquid-cooled inline four-cylindered engine that has an awesome compression ratio of 12:3:1. It comes with six-speed transmission, adjustable front forks and Dual Stage Fuel Injection (DSFI) system and responds at all speeds. The HondaCBR1000RR whacks top performance with 178 hps @13000 rpm. The ignition is computer controlled transistorized with three dimensional mapping. 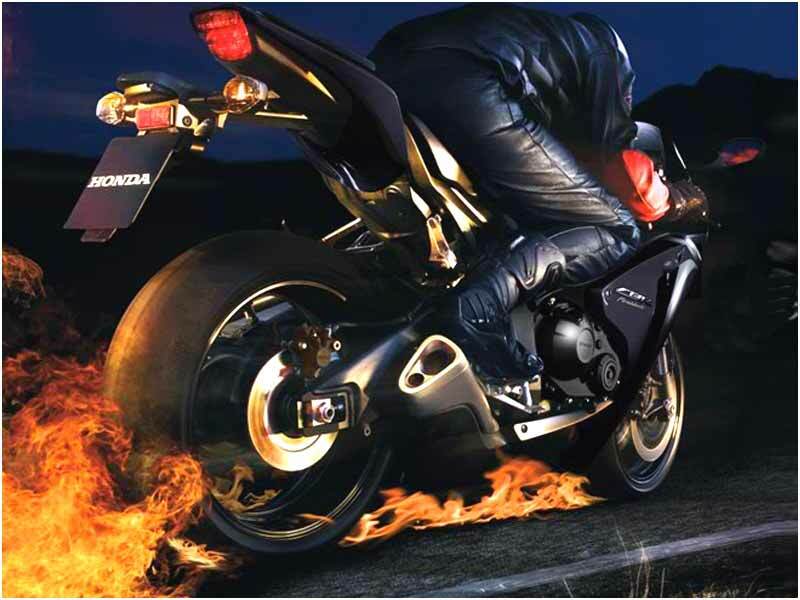 With top end sizzling features, Honda Fireblade serves and satiates the purpose of the diehard bikers. For lighter weight and to achieve mass centralizing the nose and tail get some trimming. The nose fairing appears short and gets cut and the tail too follows suit. This is to retain the MotoGP functionality aspects. The exhaust position also makes sense and it looks best from rear and sides. The CBR1000RR's sturdy and light die-cast aluminium chassis has an inverted fork, Unit Pro-Link rear suspension and radial-mounted front brakes. The chassis is a reinforced version of the CBF600's frame. The eye catching styling of Honda CBR1000 RR is the pinnacle of style statement in the world of street machines. From nose to tail, Honda CBR1000RR reflects innovation to suit the best aerodynamic features. 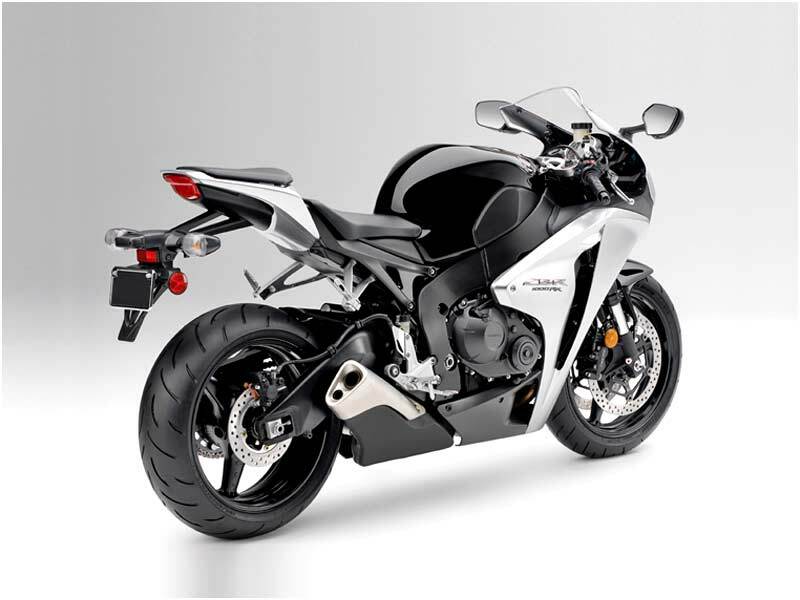 In the latest version of CBR1000RR the exhaust system is no longer a center-up underseat design. The underseat location being close to motorcycle's center of gravity and mass, it offers a quicker handling and easy change of directions with reduced inertial effects. This side-slung exhaust system literally increases the mass centralization and compactness of the bike. To improve stability in deceleration, a slipper clutch is available with center-cam assist mechanism. Performance is further enhanced with a revised Honda Electronic Steering Damper (HESD). On the Indian roads, this bike will do well and can balance against bad driving conditions. It won't be harsh to ride on the bumpy Indian roads as well. The brake quality is mind blowing in this super bike CBR1000RR with the Anti Brake System (ABS). It's the microprocessor that fixes the amount of brake pressure needed. Even on the congested roads, Honda CBR1000 RR is expected to manage the proportion of braking between the wheels (front and rear) as it is equipped with both anti-lock and anti-pitch systems. So, even under situation of hard braking condition, this super bike can minimize weight shift onto the front wheel, keeping the rear wheel on the ground. The machine is a perfect compact one and meets the current emission standards. CBR1000RR is now more compact than before pushing handling to a new level. Blended with power packed engine and sharp body, Honda CBR1000RR is amongst the super bike and delivers decent mileage ranging from 15-20 kmpl. 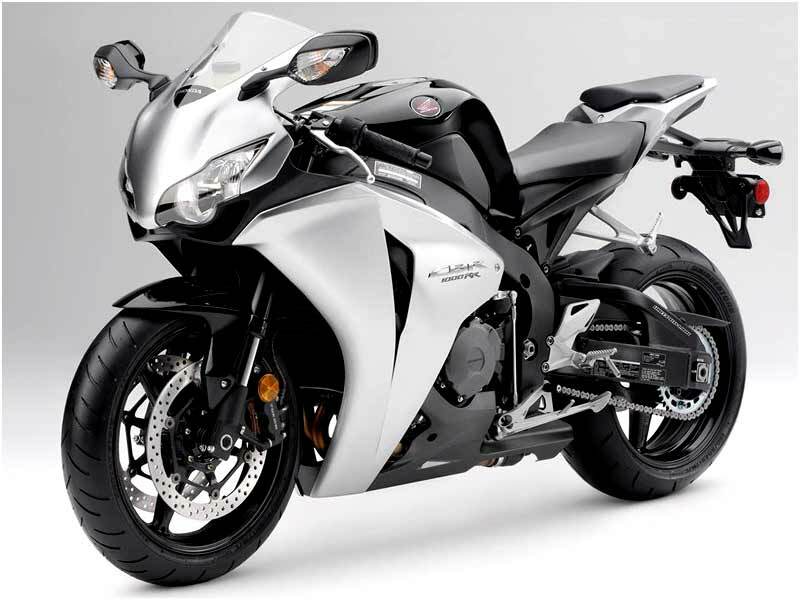 Honda CBR1000RR Fireblade is available in 2 colors: Achilles Black Mettalic and Pearl Silver Mettalic.